girlfriend is even my umbrella girl while I warm up the engine. Not really, but you can certainly pretend to be a motorcycle racer with the Shoei X-12 Kagayama 4 helmet. 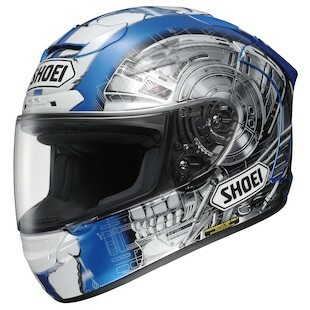 The Shoei X-12 is the helmet of choice for racers and track day enthusiasts. The helmet features the Q.R.S.A. base plate system, 5 shell sizes, and the Aero Edge 2 Spoiler making this high performance helmet the perfect option for anyone looking to go fast around a track. It's no wonder that Yukio Kagayama would want this on his dome. The Kagayama 4 Graphic emblazoned on this helmet falls in line with the white racing stripes and blue background that were a signature to previous Kagayama helmets. The twist in the Shoei X-12 Kagayama 4 is that the side profile of the helmet has a Judgement Day style terminator skull. Hasta la vista, baby.